Presidential election results map. Red denotes states won by Nixon/Agnew. Blue denotes states won by Humphrey/Muskie. Orange denotes states won by Wallace/LeMay, as well as a faithless elector in North Carolina who casted his electoral vote for Wallace/LeMay instead of Nixon/Agnew. Numbers indicate the number of electoral votes allotted to each state. This election was between former Vice President Richard Nixon and Vice President Hubert Humphrey. Governor of Alabama George Wallace also ran by the American Independent Party. 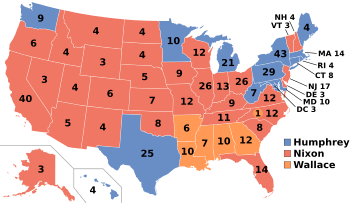 Richard Nixon won the election by 301 electoral votes. Hubert Humphrey got 191 electoral votes. George Wallace got only 46 electoral votes and a faithless elector in North Carolina voted Wallace and running mate Curtis McLay. 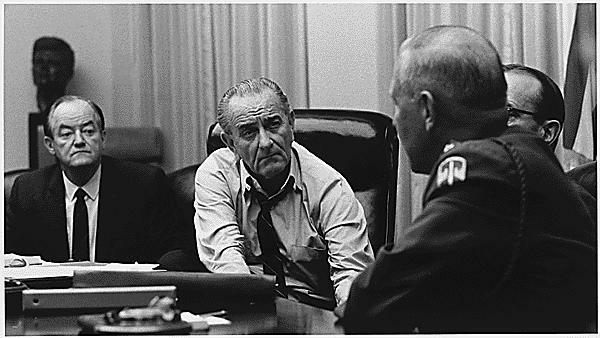 Incumbent United States President, Lyndon B. Johnson was able to run because he was elected to one full term, and served fourteen months after John F. Kennedy was assassinated. On March 31, 1968, Johnson withdrewed his nomination and Johnson said, "I shall not seek, and I will not accept, the nomination of my party for another term as your President". 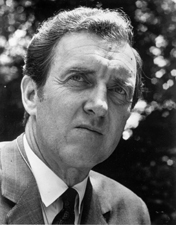 Johnson died on January 22, 1973 and the new presidential term would expire two days after. Robert F. Kennedy, brother of former United States President John F. Kennedy was assassinated on June 5, 1968 by Sirhan Sirhan in Los Angeles after winning the California and South Dakota primaries for the Democratic nomination for President of the United States. United States presidential election, 1968 Facts for Kids. Kiddle Encyclopedia.